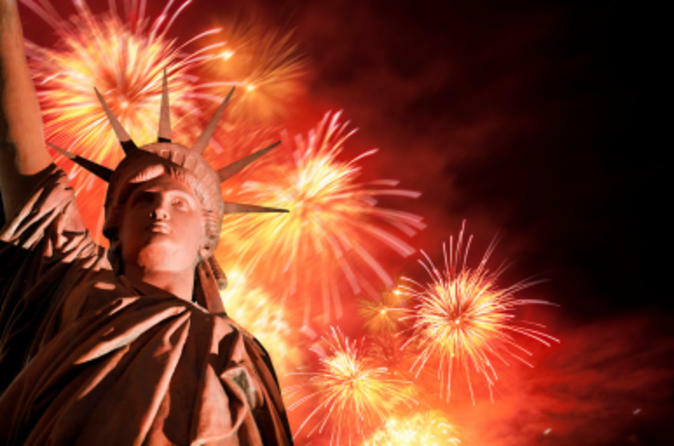 You’re invited to an exclusive all-day 4th of July celebration in New York City! Enjoy a BBQ lunch at a outdoor terrace while overlooking the Broadway and Times Square, followed by a coach tour of Lower Manhattan. In the evening, take a scenic cruise in New York Harbor onboard a deluxe yacht, passing the majestic Statue of Liberty. Enjoy a dinner buffet, open bar and DJ entertainment, and enjoy unbeatable views of the spectacular fireworks show! Your New York City 4th of July celebration begins at 1pm at Supernova’s outdoor terrace at the Novotel New York Hotel, featuring panoramic views of Broadway and Times Square. Here, enjoy a picnic lunch with a selection of skewered steak, ribs, burgers and hot dogs, plus all the fixings. You’ll then be whisked away for a tour of Lower Manhattan by comfortable coach. Your expert guide will share interesting facts and stories about the history of New York City as you make your way to where you’ll board the World Yacht Duchess for your exiting evening cruise along New York Harbor. Sit back, relax and take in views of the stunning NYC skyline, including the Statue of Liberty and Ellis Island. You’ll then be treated to a lovely dinner buffet as you capture a beautiful sunset. Then, get ready for an amazing spectacle! Enjoy DJ entertainment and drinks from the onboard open bar, and head to the outdoor sightseeing decks to watch the spectacular fireworks show. When the show is over, and the boat docks, board the coach to be taken back to Midtown, concluding an incredible 4th of July in New York City.